So the day before I took vacation to go to my quilting retreat my coworkers were asking me what I was going to do while on vacation. They know I’m a quilter, but when I proceeded to tell them that I was going on a quilting retreat and that I was taking vacation to do this everyone died laughing. I’m sure you’ve all experienced some sort of this reaction. People just don’t get it, but whatever. I explained to them that it was 4 days of sewing and eating and drinking wine, but they still didn’t understand why I would want to do that. I work for Target and they asked me, “Why don’t you make a Target quilt while you’re there?” I told them while that would be cool and all, I actually had a lot of stuff that I am working on that have deadlines and people waiting on them. I categorized this up on the top shelf of my brain to do whenever I had enough time. On Saturday night I had run out of everything I had brought to do. I was trying to think of what I could do with the remaining fabric I had and saw some white and red Kona. 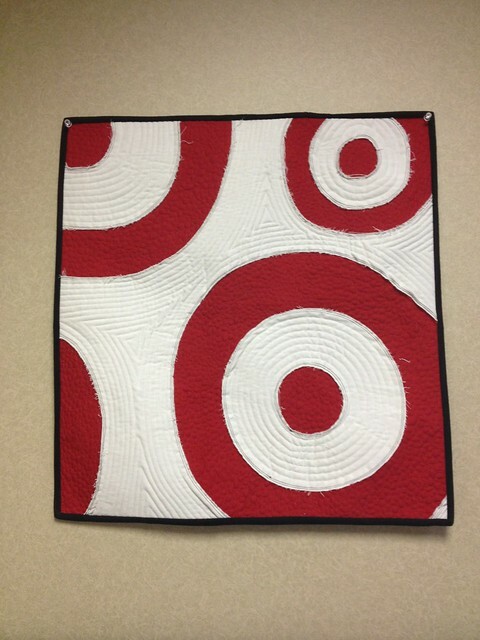 Well guess what I made guys…A TARGET QUILT. I did reverse appliqué with the red behind the white. I wanted the circles to stand out more so I did 2 lines of black stitching around the circles. 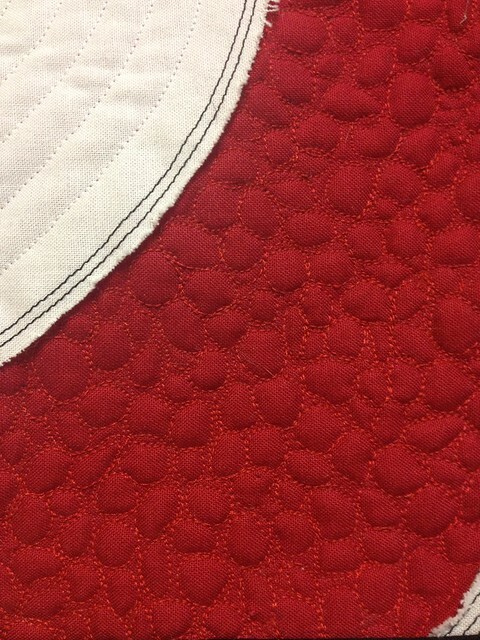 I knew I wanted to echo quilt the white and wasn’t sure what to do with the red. I was thinking concentric circles with those. Once I finished quilting the white, Charlotte, who was sitting across from me suggested dense pebble quilting. I had not thought of that and it definitely would break up the monotony of the lines… But man, to get the effect I wanted, that would be a lot of pebbles. Luckily dinner was ready and I got to stew over the decision for awhile. When I came back from dinner I had to do it. I got through 2 of the circles no problem and then I ran out of red thread. I asked around and Sam offered her spool up. I rethreaded my machine and set off again, yet this time my thread kept breaking. It was the same company, Gutterman. Hmm.. I rethreaded, redid the bobbin, thread broke again. I lifted the sole plate and cleaned, replaced the bobbin, thread broke again. Adjusted the tension throughout the hi-lo spectrum, thread kept breaking. Tried feeding the spool from a cone stand, still kept breaking. Changed spools, it STILL kept shredding. The weird thing is that it would work great on my test piece and then as soon as I would go back to the actual quilt, would break again, and only with the red thread. Almost 2 hours later I gave up. I decided to put it away and deal with it at home and not waste my time and energy dealing with finicky thread. Once I got home, things worked better, but still not perfect. Instead of only lasting 5 seconds, it would last 15, or sometimes 30. Finally after doing it in spurts, I finished it. Just don’t look at the back. It has bird nests and eyelashes, and I don’t even know what. And I don’t even care. It’s a wall quilt and no one will ever see the back, so there. 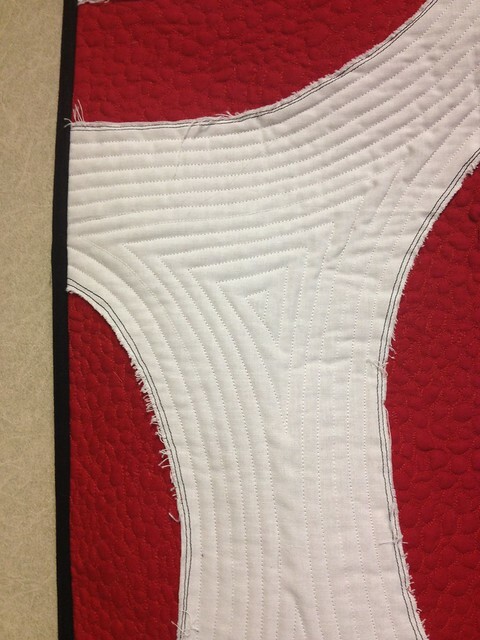 I finished the quilt with black binding and took a toothbrush to the raw edges to fray them for more dimension. There's nothing worse than thread breaking, is there? I'm sure you tried replacing your needle. I just bought a new Pfaff and it does not like Aurifil but seems to do well with Superior, Mettler, and Gutterman. Your finish is cute, even if you wanted to pull your hair out! Sounds like you were super-productive, Colby. Cute homage to Target! Kudos to you for hanging in there! Way to go! 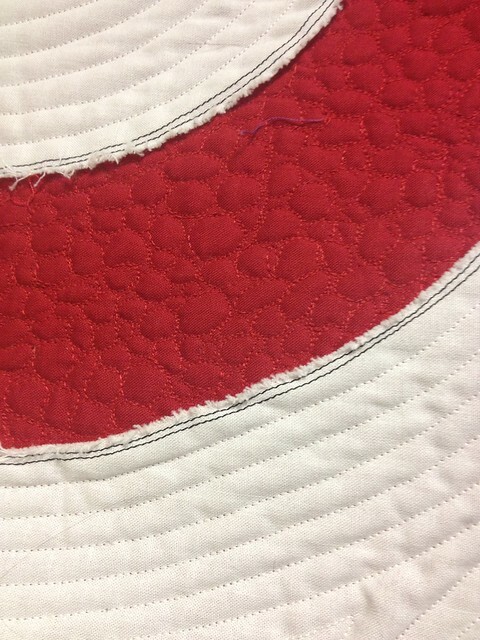 Love the quilting, but also hate those awful thread problems. I struggled for a long time with that, and finally got rid of my machine. My new machine is a marvel! No thread breaking or anything. Have you checked around for burs or sharp edges along the thread path? My old machine would only work break-free with Isacord polyester thread. I'm sure any good poly embroidery thread would also work. I think that kind of thread has more stretch in it and breaks less, but I prefer cotton. That quilt is awesome and I bet your coworkers love it! That is so weird about the thread. That happened to a friend of mine recently and she couldn't figure out what has wrong. 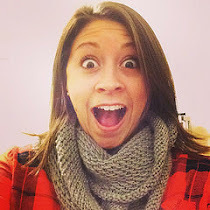 Thanks for linking up with Sew Cute Tuesday! YYour quilting and quilt is just gorgeous! !